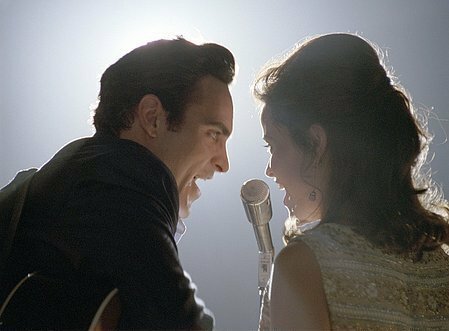 Last night I stayed up until 2 am watching Joaquin Phoenix in “Walk the Line”. I liked the story of Johnny Cash and June Carter (played by Reese Witherspoon) even better the second time around. But. There were several parts of the story that still bothered me. I’m not sure how much is fictionalized and how much is actually true, but I know that Johnny fell in love with June while he was still married. In the movie, Cash’s wife Vivian (played by Ginnifer Goodwin) is portrayed as a bitter, nagging unpleasant housewife who is never happy with what Cash is doing. She tries to hold back his career, and is always picking fights with him about not being good enough, or not helping out enough at home. Consequently, Cash finds himself falling in love with the sweet, tenderhearted, somewhat broken soul herself June Carter while on tour together. And the movie makes it seem so romantic, so right. Even though Cash and Carter make it through some incredibly tough times together, love wins out and after divorcing their previous spouses, the two eventually end up together and have what is considered one of the greatest romances of all time. What bothers me is that the movie makes it seem justifiable to have an affair if you find your TRUE soulmate. And after all, Cash had been through so much in his young life with his older brother’s early death and dealing with abuse from his father that he deserves to finally be happy. This is where I get a little unsettled. I’m not going to sit around and bash on Johnny Carter and June Cash. I’m as big of a fan of the music-and even the love story-as the next person. That’s how it is for me, period. Obviously that’s not the case for a lot of people. What do you think about the love story of Johnny and June Carter Cash? Do you think it’s ever ok to leave your spouse, however happy or unhappy you may be for someone you think is better for you? As I read your article about the movie of Johnny and June Cash and their relationship, I was struck with the realization that someone viewed it just as I. Your comments and perspective are right in tune with mine. I am certainly not anti Johnny and June; I like them, admire their talents, and I appreciate their fresh, bold, uncompromising stand (later on in their marriage) for their Christian faith. But I’m with you–to be married means “hands off” to anyone else, and a strong attraction does not make it right to pursue another relationship. I’ll respond with a counter question. Is it ever okay to stay in a marriage when your heart belongs to another? I don’t think it is always so simple. Yes, you shouldn’t have one eye open for a marriage upgrade while you are married. But lots of people find themselves in situations where despite the best of intentions and the best behavior, they love another. While we can better control our actions, it is often futile to control our hearts. And when faced with that situation, what does one do? Double down on the current marriage? Is that fair to the losing spouse? Is it fair to oneself? Perhaps you can forget the person and feelings as an idle crush. But other times it is like putting a genie back inside the bottle. I love the movie, but it is sad that the love story isn’t just a movie. Cheating isn’t okay. I’m not married, but I might as well be. I have told my SO over and over that I would rather he leave me than subject me to being a fool while he is sleeping with another woman. That part of the movie isn’t romantic at all. To answer your question — if you meet your soulmate, then you need to leave your wife/husband/bf/gf. Give your so-called loved one a flipping explanation. I would be heartbroken if my bf of four years came to me and told me he was in love with another woman, but it would certainly be preferable over reading about it in the news or catching him with her. I definitely understand your opinion. I can relate to it because I saw this film a couple of years ago and I thought exactly the same thing. I was a big fan of Cash and June, but I couldn’t get over the part in which he leaves his family for her. Well, a few years later I met my soulmate and I see the whole story from an entirely new perspective. John and June were obviously soulmates, it’s enough to look at the way they looked at each other (http://www.youtube.com/watch?v=VnmFAmx69JA). Once you meet your soulmate, you can’t live without him. It’s an irresistible mental attraction to begin with. Would it be fair to spend your life with your wife/husband loving someone else in your heart? Personally, I don’t think so. But the answer is up to each and every one of us. Hope this answered your question.